Gay Rights Activist. Friend. Lover. Unifier. Politician. Fighter. Icon. Inspiration. Hero. His life changed history, and his courage changed lives. In 1977, Harvey Milk was elected to the San Francisco Board of Supervisors, becoming the first openly gay man to be voted into major public office in America. His victory was not just a victory for gay rights; he forged coalitions across the political spectrum. From senior citizens to union workers, Harvey Milk changed the very nature of what it means to be a fighter for human rights and became, before his untimely death in 1978, a hero for all Americans. Academy Award winner Sean Penn stars as Harvey Milk under the direction of Academy Award nominee Gus Van Sant in the new movie filmed on location in San Francisco from an original screenplay by Dustin Lance Black and produced by Academy Award winners Dan Jinks and Bruce Cohen. 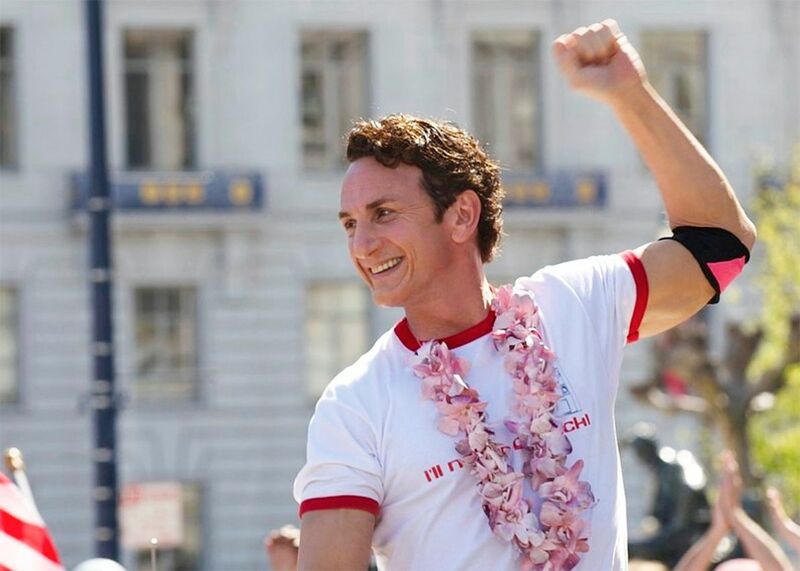 The film charts the last eight years of Harvey Milk’s life. While living in New York City, he turns 40. Looking for more purpose, Milk and his lover Scott Smith (James Franco) relocate to San Francisco, where they found a small business, Castro Camera, in the heart of a working-class neighborhood that was soon to become a haven for gay people from around the country. With his beloved Castro neighborhood and beautiful city empowering him, Milk surprises Scott and himself by becoming an outspoken agent for change. He seeks equal rights and opportunities for all, and his great love for the city and its people brings him backing from young and old, straight and gay, alike – at a time when prejudice and violence against gays was openly accepted as the norm. With vitalizing support from Scott and new friends and volunteers, Milk plunges headfirst into the choppy waters of politics. He also mentors young street activists like Cleve Jones (Emile Hirsch). Bolstering his public profile with humor, Milk’s actions speak even louder than his gift-of-gab words. Soon, he is known all across the city and even beyond, but his persistent determination to be a part of city government drives him and Scott apart. While making his fourth run for public office, Milk takes a new lover, Jack Lira (Diego Luna). The latest campaign is a success, as Milk is elected supervisor for the newly zoned District 5. Milk serves San Francisco well while lobbying for a citywide ordinance protecting people from being fired because of their orientation – and rallying support against a proposed statewide referendum to fire gay schoolteachers and their supporters; he realizes that this fight against Proposition 6 represents a pivotal precipice for the gay rights movement. At the same time, the political agendas of Milk and those of another newly elected supervisor, Dan White (Josh Brolin), increasingly diverge and their personal destinies tragically converge.